On December 5, at 5 PM, a tobacco shed in Amherst will transform with light. Shedding Light is a public art project conceived and created by artist/architect Erika Zekos and supported by, among others, the Town of Amherst, the Amherst Cultural Council, and the Swartz Family Farm, where the project will be on display December 5-31. Erika’s past projects include Greetings from MY City, which plays off the familiar concept of the tourist site postcard to allow young artists to engage and depict their own communities. Similarly, Shedding Light starts with a familiar sight of the Pioneer Valley – an aging tobacco shed – and illuminates it with a new vision. We asked Erika about the origins of the project, her background as an artist and architect, and the makings of a truly public work of art. 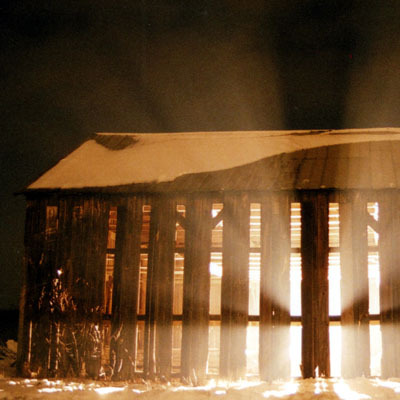 ArtSake: How did the concept behind Shedding Light, lighting up a tobacco barn from the interior “like an architectural lantern,” first occur to you? Erika: When my family moved to Amherst five years ago we would drive around to explore back roads and hidden places. The very first thought I had when I saw the tobacco sheds for the first time was, “We grow tobacco here? !” and the second was, “Wow, these buildings are so beautiful!” Seeing the sunlight streaming into a shed through the long, vertical panels I knew immediately that I wanted to switch it up and let the light stream out and into the landscape at night. As with much of my work, the idea is to call attention to the environment (both built and unbuilt) and create a forum for the questions that arise as a result of the work. The more I’ve learned about the uniqueness, simplicity, and single-use design of the tobacco sheds the more intrigued I’ve become. It’s not my intention to celebrate smoking, but it’s certainly an interesting history. Believe it or not, Connecticut Valley shade-grown tobacco is among the best in the world and is used as the wrapper layer of fine cigars. In the peak growing years of the 1920’s to 50’s 30,000 acres were planted… now it’s more like 3,000 acres. It’s no surprise then that the sheds built to dry the crop are quickly vanishing as they fall down or the land is developed into shopping malls and housing. I wanted to do something that would highlight the distinctiveness of this architectural vernacular and the vision of the shed filled with light in a winter landscape was a clear idea from the very beginning. ArtSake: How does your use of a tobacco shed on the hydroponic Swartz Family Farm relate to the core premises of the project? Erika: Shedding Light is about appreciating the ingenuity and sustainability of our farming history while simultaneously looking ahead to the future. These sheds are 150 year-old examples of the kind of simple, sustainable design that everyone is talking about today; they harnessed the wind to naturally ventilate and dry the tobacco. Collaborating with the Swartzes is perfect really because it conveys both sides of the coin. Joe and Sarah Swartz are third generation farmers dealing with the realities of bringing their product to market and working 24/7 to make a living. This doesn’t leave much for preserving aging tobacco sheds (and the shed that I’m using for Shedding Light is in pretty rough shape at the moment). But at the same time the Swartzes are very forward-thinking farmers themselves: leasing much of their land to neighboring farms and growing lettuces and herbs year round in their greenhouses, using only 1/10th the water that conventional farming requires for the same product. They also operate a CSA (Community Supported Agriculture) that invites the community to participate in the success of the farm and share in the harvest. While the physical aspects of illuminating the shed (light and shadows) will be the easiest to understand, it’s the underlying connection to the community (farming, local history, etc.) that I hope keeps this project in the memories of those who experience it. ArtSake: Nora Maroulis of wunderarts called your project “public art at its best/most impactful.” Both Shedding Light and your Greetings from MY City project use artistic creation to enhance and build awareness of one’s community. Is it this interaction between art and community that appeals to you, as a public artist? And is it the same appeal that drew you to architecture? Erika: Absolutely! The interaction between the cultural and physical landscapes is such ripe territory for exploration in both architecture and art. Architecture is about designing a better built environment, but ultimately, it’s about the experiences of the people who live in it… my public art projects deal with the architectural too, but tend to be more hands-on with regards to the interaction. They invite you in and ask you to think. Greetings from MY City (a collaboration with my great friend Gretchen Schneider) is a perfect example of that. We invited kids from neighborhoods in inner city Boston and Holyoke to create photo essays of the places and spaces that are important to them. Ultimately we create postcards with a selection of those photos, creating a document of their stories for the wider community. ArtSake: The Shedding Light project has become a community event, in every sense. The December 5 shed lighting includes a book event, a panel exploring sustainable living and green architecture, and a concurrent art exhibit including your photos of the shed and drawings by Scott Tulay. Can you describe how the project built to this exciting level of public involvement? Erika: Well, every project that I’ve ever done as an architectural designer, teacher, or public artist has invited collaboration and the sharing of ideas. In the case of Shedding Light, the conception of the piece was the easy part; actually seeing it to fruition has been an incredible journey. As soon as I talked with Terry Rooney, the chair of the Amherst Public Art Commission, it was clear that this would blossom into something bigger than the original idea. Terry suggested the idea of offsetting the energy used by the lights with a solar array, which was a perfect fit with the original concept. I then began the work of finding a shed to work with, talking with a professor at UMass Amherst about involving his students in the photovoltaic design, to a lighting designer, electrician, historians, etc. I’m also working with the Amherst Young Artists Coalition to have students document the installation in photos and film. We were just about to go ahead with the photovoltaic panels when the state ended its rebate program (two years earlier than anticipated due to high demand) so at this point we won’t be installing solar array, but we’re optimistic about bringing this to the farm in the spring. All that said, a public education and exhibit component has been a part of the project from the beginning. Scott’s drawings are gorgeous and compliment the installation perfectly. This is Amherst’s 250th birthday year and it’s a great opportunity to bring a celebration of agriculture and architecture and art to the public in this way. Shedding Light will be on display at the Swartz Family Farm, evenings from December 5 through December 31, 2009. There will be numerous events on Saturday, December 5, at the Nacul Center in Amherst. 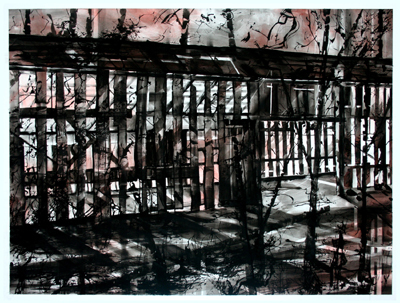 At 2 PM will be a lecture by Dary Purinton and Dale Cahill, co-authors of Tobacco Sheds of the Connecticut River Valley; at 2:45 PM is the panel discussion “Living Green from the Past to the Future;” 3:30 is the opening reception of a concurrent exhibition of new drawings by Scott Tulay and Erika’s photos of Shedding Light. At 5 PM at the Swartz Family Farm, the shed will be lit up for the first time. Erika H. Zekos is an architectural designer, teacher and artist committed to projects in public art, education and architecture. She has completed numerous public art installations in Boston and western MA, as well as practiced residential, institutional and educational design. She is currently the western MA Program Coordinator and master teacher with Learning By Design in Massachusetts, a non-profit design education program. Erika has also taught architecture at Roger Williams University, Rhode Island School of Design and the University of Massachusetts Amherst. She is also a dedicated community member, serving on the boards of the western MA chapter of the American Institute of Architects, the Amherst Education Foundation and the parent organization of her children’s school. 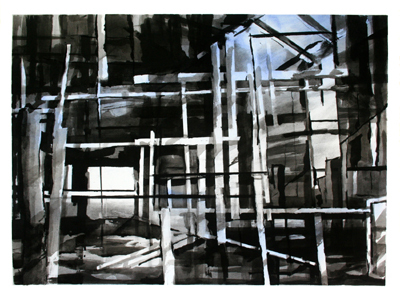 Images: photo from a test lighting of SHEDDING LIGHT by Erika Zekos; Scott Tulay, BARN INTERIOR (2009), ink, pastel, charcoal, 22X30 in; Scott Tulay, SHED AT NIGHT (2009), ink, pastel, charcoal, 30×40 in.